A magical seashell, one curious little boy and a colourful dragon is the recipe for this imaginative children's tale. Alongside his navigator, Skipper, Danny the Dragon goes on an adventure far from the sandy beaches and into the welcoming home of his new friend Jimmy. 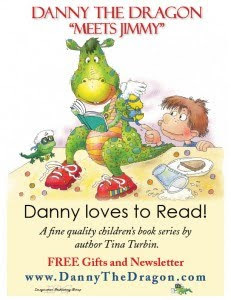 Danny the Dragon Meets Jimmy is the first in a series of books written by author, artist and humanitarian Tina Turbin. At a very young age, Tina Turbin had a passion for writing and the arts. She wrote her first children's story when she was 16 years old. She has worked in the entertainment industry and even opened her own successful studio in Los Angeles back in 1986. Soon after moving to the East Coast with her husband, she published Showbiz Kids East Coast Guide Book, a useful resource for parents looking to start their child's career in show business. Further to this, Tina has continued working with children in various ways by maintaining a strong interest in important factors in children’s lives: the family, the role of a woman and mother to society, health, nutrition and the arts. She finds it rewarding to share her knowledge through her work as a published author and continues to research and write to enrich the lives of others. 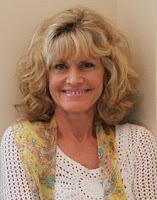 She has helped many people in the areas of allergy, celiac disease, autism and gluten-related issues. Her web site http://GlutenFreeHelp.info contains a wealth of health-based information, resources and tasty recipes to help improve quality of life. You can read more about Tina Turbin and her humanitarian efforts on her site http://www.TinaTurbin.com. You can also sign up for her newsletter and enter monthly contests on http://DannyTheDragon.com. I was so excited when my package arrived with our family's copy of Danny the Dragon Meets Jimmy. I instantly loved the quality of the hardcover book and its large size (approx. 8.5" by 11"). The illustrations, wonderfully designed by Aija Jasuna, easily bring the imaginative story to life. From beginning to end, my daughter was captivated by the storyline and eagerly anticipated the pages yet to come. I also love how Danny is very polite and models good manners. The story is suitable for kids aged 4-8 and is great for read-aloud, shared reading, and independent reading for the older kids in this age group. However, the story line is sure to appeal to anyone with an elaborate imagination. I especially enjoyed the audio CD entitled "Dreams" which both my children loved listening to in the car. This CD was released at a large Sesame Street Concertin Los Angeles not too long ago and the best part is that all profits go to the Celiac Disease Center at Columbia University. Along with the audio version of the story, you can also listen to several musical compositions. It's hard for me to pick a favourite because there are about four tracks that I thoroughly enjoy listening to while driving. In any case, it's no wonder that Danny the Dragon Meets Jimmy was nominated for a Best Book Award in 2009. I can't wait to see what adventures lie in store for the lovable characters Danny, Skipper and Jimmy.